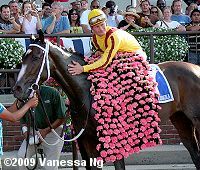 Jockey Calvin Borel and Rachel Alexandra returns after winning the Mother Goose Stakes. The $300,000 Mother Goose Stakes (G1) is the middle leg of the New York Triple Tiara, but this year's renewal turned out to be a public workout or a virtual walkover. Although five 3-year-old fillies originally entered this 1 1/8 mile trip around one turn of the Belmont Park main track, two scratched the day of the race, leaving a field of three. As expected, Kentucky Oaks and Preakness Stakes winner Rachel Alexandra was sent off at 1-20 odds, making her second start for new owner Stonestreet Stables and trainer Steve Asmussen. In to challenge the daughter of Medaglia d'Oro were 6-1 second choice Flashing, winner of three straight going in including the Nassau County last out, and 11-1 Malibu Prayer, an allowance winner last out and making her stakes debut. Racing conditions were ideal with sunny skies and temperatures in the upper 70's, with 13,352 in attendance, a figure artificially inflated by two promotions, a Rachel Alexandra bracelet giveaway and free admission for female fans. When the gate opened, jockey John Velazquez aboard Malibu Prayer was hustled to the lead immediately and was stalked to her outside by Flashing through very fast fractions of 22.57, 44.66, and 1:08.86 over the fast track. Jockey Calvin Borel kept Rachel Alexandra in hand early, staying well off the rail on the backstretch about 3 lengths off the pace. At the 3/8 pole, Borel asked Rachel for run and got it, as the heavy favorite came through the hole between the two tiring pacesetters, taking over the lead at the 1/4 pole. Borel tapped her with his whip right handed and she drew off with authority, opening up an 8 length lead at the 1/8 pole through a mile in 1:33.60. Under wraps through the final furlong she cruised to a 19 1/4 length victory over Malibu Prayer in a new stakes record time of 1:46.33, just 0.93 seconds off Secretariat's track record. It was another 12 1/4 lengths back to Flashing third. As well, the margin of victory was also a stakes record, eclipsing the previous record of 13 1/2 lengths set by Ruffian in 1975. With just three starters, place, show, exacta, and trifecta wagering was cancelled. 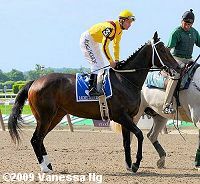 With the amount of money bet on Rachel Alexandra, the race had a minus win pool on Rachel Alexandra of $18,698.62, with NYRA's share being $1,162.39. A minus pool means the amount paid out to the bettors due to the minimum pay-off of $2.10 was more than the amount wagered after the take out (15% for win bets at NYRA) was removed from the pool. Left: Rachel Alexandra takes her walk down Victory Lane with assistant trainer Scott Blasi and owners Jess and Barbara Jackson of Stonestreet Stables. Jackson said, "How about that! I am a modest guy. I was hoping for maybe 10 lengths. She is a special filly, she is a champion, she is a lady. We don't know where her bottom is. She has beauty combined with speed, so fast. I think she's the best 3-year-old right now. 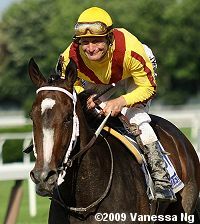 (Calvin Borel and Rachel Alexandra)are perfectly matched. Calvin has all the instincts, she expresses herself to him, he knows he doesn't have to lay down on her, and she just runs. She loves to run." 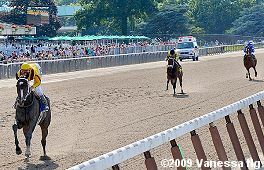 Right: Rachel Alexandra in the winner's circle. Left: Rachel Alexandra in the post parade. 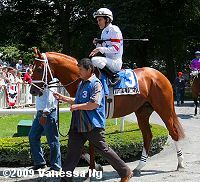 Her jockey Calvin Borel said, "Steve (Asmussen) told me 'Ride your race. You know her as good as me and I think she's a kind of a grinder,' and I said 'Yes sir, that's what she is." I think she's just a wonderful animal, she grinds fast, you don't have to be in front, you can take her back. She's a racehorse, this is a racehorse. Believe me, she's not normal, I'm telling you, she's unbelievable. I nudged (her) on the turn for home around the 1/4 pole but that was it. To make sure she'd get something out of it and do something for me. I knew they were going fast early but around the 3/8 pole they were getting tired and I kind of squeezed her a little bit and she just went in there. It's unbelievable, (the crowd) may love me but when you ride good horses it makes you that good." Right: Rachel Alexandra in the paddock before the race with assistant trainer Scott Blasi. Rachel Alexandra gets a bath at the barn after the race. 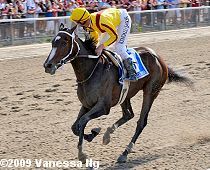 Her trainer Steve Asmussen said, "We are very proud of Rachel Alexandra. (Owners) Mr. (Jess) Jackson, Barbara (Banke) and Hal McCormick, what a great thrill for them. For them to step up and purchase a filly like this, and then to go ahead and campaign her is a thrill for them. To have a horse like her in your barn, I am really fortunate. She's a great athlete. She's just extremely endearing to you. She has a soft and kind look feel. When she walks over, she takes those great big strides. Everything about her she just excites you. You just want good things for her. Our job is to take care of her and defend her at all times. I can't say enough about Calvin Borel's ride. They took it right to her with 44 and change, the 1/9 shot and all the pressure in the world. He just let them go about their business and did what's best for her and he needs to keep doing that." 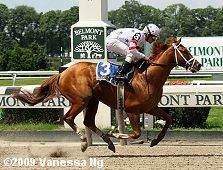 There are several possibilies under consideration for her next start, including the Coaching Club American Oaks at Belmont on July 25, the Jim Dandy at Saratoga on August 1, and the Haskell Invitational at Monmouth on August 2. Left: Second place finisher Malibu Prayer heads out of the paddock before the race with trainer Todd Pletcher on the right. Her jockey John Velazquez said, "Well, she broke on top and I just let her do her thing and the best horse won it." Asked about Rachel Alexandra he added, "She's a champion that's for sure." Right: Third place finisher Flashing returns after the race. 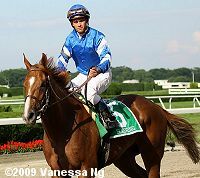 Her jockey Javier Castellano said, "She's a very talented filly and I am not to take anything away from the filly that won. I thought horse was better than she showed today and I didn't mean to go that fast early on. She will show up next time." On the undercard, a field of seven older New York-breds competed in the $65,000 Fratello Ed Stakes at 1 1/16 miles on the main track. 9-1 Future Prospect set the early pace of 22.70, 45.06, and 1:08.54 while 1 1/2 lengths ahead of 4-5 favorite Wishful Tomcat stalking him in second. Entering the stretch, jockey Ramon Dominguez asked the favorite for run and got it, as Wishful Tomcat hooked the pacesetter at the 3/16 pole. Wishful Tomcat passed him easily and drew off to win by 1 1/2 lengths in 1:40.47. It was a long 7 1/4 lengths back to late-running 2-1 second choice Z Fortune third. The Richard Dutrow Jr. trainee improved his record to 8 wins, 3 seconds, and 2 thirds in 17 starts, earning $420,654 for owners IEAH Stables and Pegasus Holding Groups.